“Mariah’s sixth-period teacher, Sue Reynolds, ordered her to remove the shirt during a meeting of the Associated Student Body. When Mariah protested, Reynolds sent her to the principal’s office. Mariah, who also plays on her school’s golf and softball teams and has been involved in school politics since seventh grade. Principal Michael Ghelber gave Mariah an ultimatum: Remove the shirt or remain in his office. Under protest, Mariah changed shirts and returned to class. Then, she went to the ACLU. Meanwhile, the spokesperson also confirmed what our commenters speculated: Glen Senk, the CEO of the parent company, Urban Outfitters, Inc., is an openly gay man who has been in a committed relationship for over 30 years. However, Richard Hayne is still the founder and current chairman and does indeed have a record for supporting right-wing Republicans who are against abortion and gay rights. Lest we get cynical and think Senk was appointed to divert attention from Hayne, let’s hope instead that he got the job based on his merits and that maybe, just maybe Hayne’s has changed his views a little. We can hope, right? 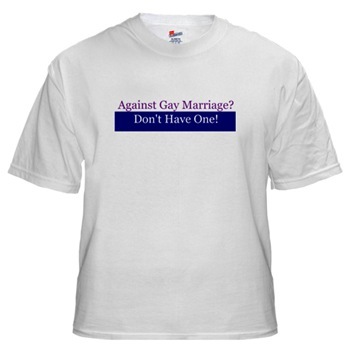 To purchase Gay Marriage T-Shirts and more visit Cafe Press!